In this Dutch name, the family name is "van Houten", not "Houten". Carice Anouk van Houten (Dutch pronunciation: [kaːˈris aːˈnuk fɑn ˈɦʌutə(n)]; born 5 September 1976) is a Dutch actress and singer. She was born to writer and theatre-radio producer Theodore van Houten. Her first leading role in the television film Suzy Q (1999) won her the Golden Calf for Best Acting in a Television Drama; two years later, she won the Golden Calf for Best Actress for Undercover Kitty (2001). She gained widespread recognition for her performance in Black Book (2006), the most commercially successful Dutch film to date, for which she won her second Golden Calf for Best Actress, in addition to nominations from the Chicago Film Critics Association, the European Film Academy, and the Online Film Critics Society. She was nominated for a Saturn Award for Best Supporting Actress for Valkyrie (2008), and won her fourth and fifth Golden Calf Awards for Best Actress for The Happy Housewife (2010) and Black Butterflies (2011). Her other notable English-language performances include Repo Men (2010), Black Death (2010), and Brimstone (2016). Since 2012, Van Houten has received international recognition for her role as Melisandre on the HBO television series Game of Thrones (2012–present), for which she has been nominated for two Screen Actors Guild Awards for Outstanding Performance by an Ensemble in a Drama Series. Van Houten was born on 5 September 1976 in Leiderdorp, Netherlands. Her mother, Margje Stasse, is on the board of Dutch educational TV, and her father, Theodore van Houten (1952–2016), was a writer and broadcaster. She was brought up watching silent films; in an interview she professed to prefer playing scenes without dialogue. She has a younger sister, Jelka van Houten, who is also an actress. Her paternal grandmother was Scottish. Van Houten went to the St. Bonifatiuscollege (high school) in Utrecht, where she played the leading role in Hugo Claus' Tijl Uilenspieghel, directed by Ad Migchielsen. Van Houten studied briefly at the Maastricht Academy of Dramatic Arts but continued her professional education after one year at the Kleinkunstacademie in Amsterdam. Van Houten played her first leading role in Martin Koolhoven's TV film Suzy Q. She won a Golden Calf for her part as Suzy. She also won the Pisuisse Award and the Top Naeff Award for her stage acting and another Golden Calf for her part as the kitten that becomes a woman in Undercover Kitty (2001). The first time she could be seen in cinemas in the U.S. was when Martin Koolhoven's AmnesiA (2001) got a small theatrical release. Van Houten won a Golden Calf for her performance as Rachel Stein in Black Book (2006) at the Netherlands Film Festival. Black Book's director Paul Verhoeven said about her in a television interview: "Never in my life I have worked with an actress this talented", and when asked to compare her with Sharon Stone he said "Carice can really act". The international press was also enthusiastic about her role in Black Book. In December 2006, Van Houten withdrew from a theatre production of Alex van Warmerdam due to personal reasons. According to a theatre spokesman it was because of a work overload. Carice's first English spoken film was Dorothy from French director Agnès Merlet. In 2008 she starred in the non-commercial short movie Zingen in het donker (English: Singing in the dark), a drama on domestic violence. She appeared in the magazine Vanity Fair in the issue for March 2008, photographed by Wayne Maser. In 2008, Van Houten had a role opposite Leonardo DiCaprio in Body of Lies but her scenes did not make the final cut of the movie. On 4 October 2008 filming began on From Time to Time directed by Julian Fellowes. It is based on the children's literature classic The Chimneys of Green Knowe by Lucy M. Boston. Van Houten stars as Maria Oldknow. In April 2009, it was announced that Van Houten would star in Black Death by British director Christopher Smith and in the Dutch film Komt een vrouw bij de dokter (English title: Stricken), based on the novel of the same name by Ray Kluun. She also starred in the science fiction thriller Repo Men. In July 2011, Van Houten was cast as the priestess Melisandre in the second season of HBO's fantasy TV series Game of Thrones. In 2012, Van Houten appeared in Antony and the Johnsons' "Cut the world" video, which was directed by Nabil Elderkin and also starred Willem Dafoe and Marina Abramović. In November 2012, the video for "Particle of Light", the second single from her album, See You on the Ice, debuted on YouTube. It was written by Howe Gelb of Giant Sand. In May 2015, she played Annika Van Houten (Milhouse's cousin) in The Simpsons episode "Let's Go Fly a Coot". She was cast specifically because of her last name. In 2016, she played the role of Leni Riefenstahl in Race. In 2016 she appeared in Brimstone, her fourth collaboration with director Martin Koolhoven. Other cast members are Dakota Fanning, Kit Harington and Guy Pearce. Van Houten is in a relationship with Australian actor Guy Pearce. [clarification needed] On 29 August 2016, she gave birth to their son, Monte Pearce. She previously dated German actor Sebastian Koch, whom she met on the set of Blackbook. Van Houten has stated that Hollywood makes her unhappy: "I have seen Hollywood, and although I have nothing against it, it's not my kind of life. My agent is shocked that I want to stay in Europe," adding, "If Hollywood offers me a great part, of course I'll take it, but I just don't want to live there". Van Houten is friends with fellow Dutch actress Halina Reijn, whom she has known since 1994. They worked together in the movies Black Book and Valkyrie. In 2013, the two published a book together called Anti Glamour, a parody style guide and a celebration of their friendship, as well as a candid look into the unglamourous back-stage side of their lives. Although the two occasionally kiss on camera, and have joked about being lesbians, there is no actual romantic involvement. She is a lifelong fan of Laurel and Hardy and in June 2016 she called in to The Ross Owen Show on Black Sky Radio to talk about her love of the comedy duo. 2002 Luifel & Luifel Roos Episode: "De Krottenkoning"
2004 Russen José Machielsen Episode: "De zevende getuige"
2004 Kopspijkers Georgina Verbaan Episode: "Dance-4-Life"
2006 Koppensnellers Georgina Verbaan Episode: "1.16"
2015 The Simpsons Annika van Houten (voice) Episode: "Let's Go Fly a Coot"
2016 Robot Chicken Melisandre, Sharon, Mama Bear (voices) Episode: "Triple Hot Dog Sandwich on Wheat"
^ In isolation, the surname is pronounced [vɑn ˈɦʌu̯tə(n)]. ^ "Zwartboek beste film aller tijden – Cinema.nl Nieuws" (in Dutch). Cinema.nl. Retrieved 25 November 2010. ^ "Carice – vijfde Gouden Kalf" [Carice – Fifth Golden Calf]. NOS (Dutch Broadcast Foundation) (in Dutch). 1 October 2011. Archived from the original on 3 April 2017. Retrieved 3 April 2017. Actrice Carice van Houten heeft vanavond voor de vijfde keer een Gouden Kalf gewonnen. Het is nog nooit eerder voorgekomen dat een Nederlandse actrice vijf Gouden Kalveren won. ^ Van Houten, Carice (5 April 2013). "College Tour". College Tour (Interview) (in Dutch). Interviewed by Twan Huys. Amsterdam: NTR. 3:00 minutes in. Retrieved 25 October 2014. ^ Slater, Lydia (5 March 2010). "Euro star: Carice van Houten". London Evening Standard. ^ Biography for Carice van Houten. Retrieved 25 November 2006. ^ Winnaars Gouden Kalveren 2006 Archived 12 March 2007 at the Wayback Machine, 6 October 2006. Retrieved 7 October 2006. ^ Stigter, Bianca (4 September 2006). "Carice van Houten slaat in als een bom" [Carice van Houten hits like a bomb] (in Dutch). NRC newspaper. Archived from the original on 7 January 2008. Retrieved 7 October 2006. ^ ANP (6 December 2006). "Carice van Houten trekt zich terug uit voorstelling". nu.nl (in Dutch). Retrieved 17 December 2006. ^ Van Houten Archived 11 December 2008 at the Wayback Machine (February 2008) in the magazine Vanity Fair. Retrieved on 13 December 2008. 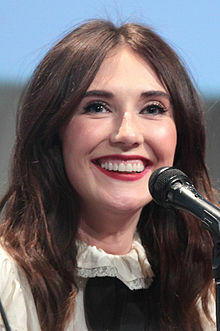 ^ Carice van Houten uit Hollywood-film geknipt. NU.nl. 18 September 2008. ^ "Repo Men Madness! Six Interviews, Seven Clips, Plus B-Roll". Dread Central. Retrieved 2 May 2016. ^ Film, Nabil Elderkin's nabil.com website lists the video. Video at vimeo. Retrieved 12 August 2012. ^ News, antonyandthejohnsons.com webpage, 6 August 2012. Retrieved 12 August 2012. ^ Birth announcement, 29 August 2016. ^ Will Lawrence (24 May 2013). "'Flashback Friday: Carice van Houten". Wonderland Magazine. Retrieved 4 October 2018. ^ a b "Carice van Houten 'afgewezen' door Halina Reijn" [Carice van Houten 'turned down' by Halina Reijn] (in Dutch). De Telegraaf. 14 December 2013. Retrieved 25 October 2014. ^ "Beroemdemeidenlol: het 'stijlboek' van Van Houten en Reijn" [Famous chicks' fun: Van Houten and Reijn's 'style guide'] (in Dutch). NRC newspaper. 14 November 2013. Retrieved 25 October 2014. ^ "'Anti glamour': Halina Reijn & Carice van Houten" (in Dutch). De Wereld Draait Door. 8 November 2013. Retrieved 25 October 2014. ^ "Carice van Houten en Halina Reijn zoenen voor fotoshoot Linda" [Carice van Houten and Halina Reijn kiss for fotoshoot in Linda] (in Dutch). NU.nl. 19 November 2013. Retrieved 25 October 2014. ^ "Carice Van Houten on The Ross Owen Show". ^ "Carice is de vrouw van Leonardo en Jude???". MovieReporter.nl. 28 September 2007. Archived from the original on 15 October 2007. Retrieved 28 September 2007. ^ "Carice van Houten – See You on the Ice (CD, Album)". Discogs. Retrieved 22 October 2012. ^ Nolfi, Joey (14 December 2016). "SAG Awards nominations 2017: See the full list". Entertainment Weekly. Retrieved 14 December 2016. Wikimedia Commons has media related to Carice van Houten.